A new report from Inclusive Boards has found that senior leadership in British tech is severely lacking in diversity. The alarming stats show that women only make up 12.6% of board members in the sector and just 8.5% of senior leaders in technology are from a minority background. Learn more about the report from The Guardian, and about the women at Red Badger here. With a new definition of DevOps put forth by DevOps author and researcher, Gene Kim at the DevOps Enterprise Summit in Las Vegas, a new question has arisen - what is a DevOps engineer? This role, the most in demand job of 2018 according to LinkedIn, is in a state of suspension due to this new definition. But fear not, Enterprisers Project has picked apart this new definition of DevOps and what exactly a DevOps engineer really is. Starling Bank, the digital bank, will no longer be limited to its digital boundaries. Financial Times reports that in a new partnership with the Post Office, Starling customers will be able to deposit and withdraw cash over the counter at Post Office branches nationwide. This news comes as traditional banks make bigger moves towards online services. 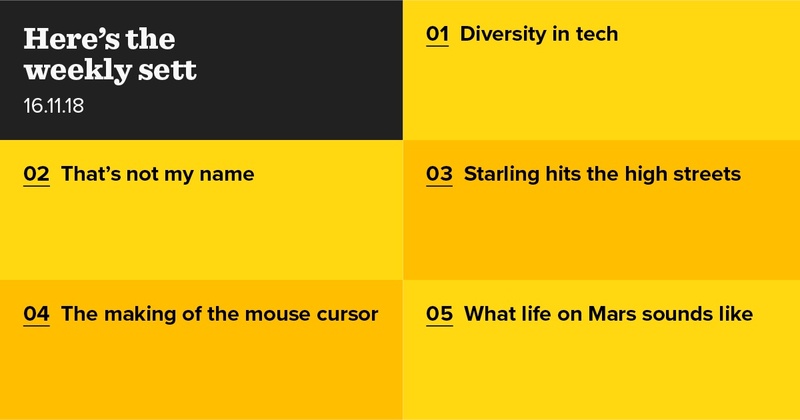 This video from Posy on Youtube outlines how the mouse cursor came about. The mouse cursor began life, similar to its current iteration, as a vertical arrow, conceived by and demonstrated by Douglas Engelbart at (the awesomely named) ‘mother of all demos’. From this, the mouse and its cursor kept on throughout computing history and never once dropped its accidental name (whose origin Engelbart can’t remember). NASA’s Mars rover, Opportunity, had one last gift to give before going to sleep due to the planet’s windy season. Scientists transformed Opportunity’s image of its 5000th sunrise on Mars into music using data sonification. The process is a flexible technique used in several domains, but in this instance the image was scanned by scientists pixel to pixel, after which pitches and melodies were assigned to specific characteristics in the data, such as brightness and colour. The composition (called ‘Mars Soundscapes’) will be debuted at the Supercomputing SC18 conference this week, but you can learn more about it from Ars Technica.